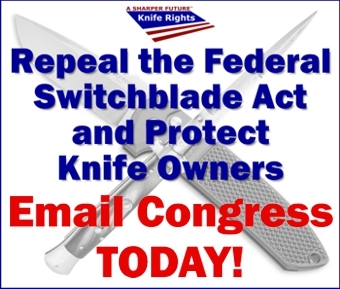 The Knife Owners’ Protection Act (KOPA) including repeal of the Federal Switchblade Act is now filed in the House and Senate. H.R.84 in the House is sponsored by Rep. Andy Biggs. Its companion bill, S.3264 in the Senate is sponsored by Sen. Roger Wicker. The next step is to gain additional co-sponsors for these bills. Please use Knife Rights’ Legislative Action Center to easily email your Senators and Representative in Congress: CLICK HERE to email your Senators and Representative. Originally conceived and authored by Knife Rights in 2010 and first introduced in 2013, KOPA will remove the irrational restrictions on interstate trade in automatic knives that are legal to one degree or another in 44 states, while also protecting the right of knife owners to travel throughout the U.S. without fear of prosecution under the myriad patchwork of state and local knife laws. Unlike S.1092, the problematic and seriously inadequate Interstate Transport Act that was recently marked up in Senate committee and which is being promoted by one segment of the industry, S.3264 and H.R.84 include a robust Right of Action that would actually provide real protections for knife owners that need these protections the most. We need your help to gain additional co-sponsors. Please call or email your Senators and Representative and urge them to co-sponsor this commonsense legislation. 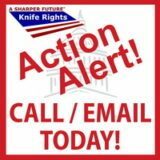 You can use Knife Rights Legislative Action Center to easily email Congress: CLICK HERE to email your Senators and Representative. A Right of Action provides for persons unlawfully detained for transporting their knives properly secured in compliance with the act to seek financial compensation from a jurisdiction that ignores the intent of Congress to protect these travels. Without a strong right of action, there is no deterrent—biased and rogue jurisdictions like New York and New Jersey would have no incentive to follow the law. In a state like New Jersey, where knife law offenses are felonies, it is especially critical to dissuade them from prosecuting law-abiding citizens. Lacking a Right of Action, acting with impunity, without fear of any meaningful recourse from their law-abiding victims, these rogue jurisdictions will further persecute citizens who attempt to defend themselves from illegal, and unjust or misguided enforcement actions. A robust right of action holds jurisdictions financially accountable if they willfully ignore the law. A strong right of action causes jurisdictions to consider these adverse repercussions before they arrest or prosecute an individual that is protected under the act.